What kind of curve is using here? sometimes when I am floating around world economic forum, I see this great algorithmic diagram that links all relative keywords (or sub related topics). Especially, I am looking at curves. What curvatures make this, how connection curves behave or what the logics to make those curves. If you have any hints or ideas, please share some of your thoughts. Thanks! That looks like a Bezier curve. It has 4 control points. Two define the ends and the other two define the tangent direction at the respective ends. It is widely used simply as ‘spline’ in text and image processing software. You can also use Tangent Curve component that only needs start and end point of the curve and a tangent vector for each point. 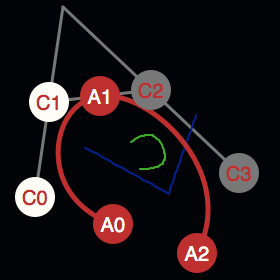 Divide 2 inner/outer circles into 2 pts arrays (or lists). For each index in outPts, get the outPt and find the closest index in innerPts. “Shift” according, say, a random range (kinda: left/right) that closest index and get the inner Pt.